Going to the airport can feel very chaotic, especially if you do not travel on a regular basis. If you have not traveled for a couple of years or more, this could very easily be a new experience for you. Don’t worry though, that is what we are here for. The Transportation Security Administration, better known as TSA, has a pretty impressive list of rules that are strictly followed and enforced in airports worldwide. Any of these regulations that are violated can whittle away your money, time, and can even get you in serious trouble with security when caught unprepared. There is never a good time to get stuck in a long line for check in or Security but add to that the pressure of missing your flight and the airport can be your worst nightmare. How Early Should I Be at the Airport? There is no set price for what checking your luggage costs; there are simply too many Airlines and each of them charges something different. Consider also, that in the present economy, the checked-baggage costs can change at a moments notice. This is something that you may want to investigate before booking your flight. Most will charge $25 per bag, and if it exceeds 50 lbs, the price can be anywhere from $25-$100. It is an exceptionally good idea to weigh your suitcases one last time at an empty scale before getting up to the counter. At this point if your suitcases are over fifty pounds, start shifting things. If you can fit your bathing suit and flip flops in your carry on, it’s worth saving the extra $25-$100 for overweight baggage don’t you think? After all, aren’t there some souvenirs that you would rather spend that money on? The check in counter is just the beginning but can cost you a lot of time. Consider that most of the people that are checking-in in front of you are probably departing around the same time as you are. So that being said, you are not any more stressed than they are about getting to the gate! You will find that most of the airlines have become computerized. Welcome the Electronic Age! Be prepared by having your credit card and your picture id at the ready!! You will also hear this over the loud speaker so much that you will be dreaming about it for nights to come. Most airlines will have computer kiosks that you will use to check in which allows each agent to be working with 2-4 groups at a time. Just touch to screen to begin and it will ask you how many passengers are flying on your booking number as well as how many checked bags you have per person. Luggage locks are a thing of the past, and the agents at the check in counter may ask you to remove them. Keep in mind that post 9/11 security has the right to inspect your checked luggage. If you insist on having a lock, make sure that the one you get has the TSA approved logo as they allow airport security to unlock and inspect your checked bags. Non-TSA locks will be cut and all luggage is subject to be searched. Remember that this has nothing to do with privacy, and everything to do with safety. 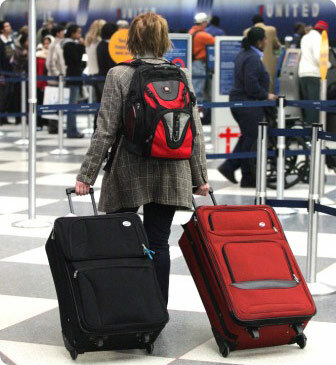 The agent will weigh your luggage; print out your suitcase tags and your boarding pass. Be prepared to hand over your picture id, (travel regulations will soon be changing and passports will be the only accepted photo id) and your credit card just in case you are required to pay for checked luggage, or exceed the weight limit. Most agents will allow you to shift things if you’re suitcase is slightly overweight; but you can avoid this by weighing your luggage ahead of time. SMILE while the agent is reviewing your stunning photos on your ten-year-old driver’s license or mug-shot passport. Don’t be frightened; they are just looking for any resemblance of the person in the photo. Once they realize that it is in fact you, they will hand back your id, credit card and boarding pass but say goodbye to your suitcase. If you are checking bags this is where you will be saying "see you on the other side." Keep your Driver’s license or passport and boarding pass handy, you will need it again to get through security. What Will Speed The Process Along? There is really no way to make things go faster, as lines and the number of staff agents working to check people in as well as the time it takes to get through security varies and is unpredictable. You can definitely help yourself and those around you by having your travel documents and credit card ready. Plus having your checked baggage weighed before you get to the counter, this allows the agent to get you swiftly checked in and on your way to security. If you are flying Southwest, you can pre-print your boarding pass as early as 24 hours before your scheduled flight departure on Southwest’s website! Because Southwest does not have assigned seating, the earlier you check in, the better the number you will get for boarding. Southwest boards by letter and number, first they board the A group, then B group, and last the C group. Boarding will go something like this: A 1-15, A 16-30, A 30-45, B 1-15, B 16-30…. and so on. For example, if your ticket says A-36, then you will be boarding nestled in between ticket holders A-35 and A-37 in the corresponding group A 30-45 called by the boarding agent. Someone who checks in online 24 hours in advance will likely get really good seating. If you wait until you are at the airport to check in, there is a good chance group C will be printed on your ticket. For those of you who are interested, Southwest has an early bird check-in that allows you to check-in 36 hours before your scheduled departure; however, this is a $10 charge but it is a small price to pay for good seating. Considering Southwest is less expensive than your bigger Airlines, and they don’t charge for checked baggage, $10 is a drop in the bucket. Once on board, there is open seating so you may sit wherever you wish, providing of course that another passenger does not already occupy the seat.